As he watched his crew slowly bring the end of the world to light, Antar found it increasingly difficult to see this as anything but the end of himself. A long time ago he had realized that the full extent of a life demanded the experience of both pleasure and pain; piety and indulgence. He had explored the darker side with fervor and reveled in what he found. With the Blood Raiders he had found not only the other, missing side of his own self, but fellow souls who shared that same drive. Religion and hedonism were finally combined in a cult to the individual that nonetheless presented Antar with the strongest ties he had ever felt to any group of people. He had found himself, home at last. Part of those ties had been the mutual hunger for more, which no one truly thought would ever be sated. It was a real but unstated pleasure of anyone's life to have a mission that would not be completed; for if they were to reach the end of the road, there would be nowhere else to go. Antar walked through the ship, inspecting its metal interiors. He stroked a hand over a cold wall. This dead thing was the end of the Blood Raiders. Once your dreams had come true, Antar reasoned, all you wanted would be gone, and you would have nothing left to do but to die in resigned silence. The mass harvesting would fulfill every possible demand the Sani Sabik could possibly have for blood, and if they were to find their thirst rising to even greater heights, the power of this superweapon, wielded correctly, would establish Bleeding farms great enough to utterly quench it. They were done. Antar had not foreseen this end for himself. He had expected to go out in fire. So when a watchful crewmember reported a Thukker vessel creeping in, and when he saw where the Thukker ship was headed - not for their vessel but for the drones and the hive - he smiled, and then grinned so wide he had to turn away. And he told his people not to worry. Most of New Eden would never know the horror of Antar's deeds, or the bravery of the Thukker crew. They would only know the cataclysm which followed, and the pain of millions as they suffered a fate that would satiate even the most devoted Blood Raider's thirst for widespread destruction. There was no pain for Antar or Kotan. Existence for the crewmen aboard both ships had ceased without their being aware of its instantaneous termination, as the constituent particles of their physical selves were torn apart and scattered into the void at velocities approaching the speed of light. It was just as well for them. Of all the people touched by the event they had triggered, theirs was the most humane fate. For neither captain knew that the immense stock of isogen-5 which detonated before their eyes was entangled with numerous stockpiles in even greater quantities, assembled for a very specific purpose, and deliberately scattered throughout the New Eden cluster and beyond. Nor could they know that the ancient race which had placed them there possessed not only a vision beyond the grasp of today's science, but also the technological advancement necessary to realize its potential. But all tools, no matter how simple or complex, possess a duality of purpose. Fire can provide life-giving warmth, or can burn the flesh from the bone. "I'm sure this was covered during orientation," Dr. Garcia stated, loud enough to draw the attention of other staff in the cramped facility. "But Cassandra would tell you if there was a problem." The young technician squirmed in his chair. As the newest member of the team, he would have preferred to not be the one to announce that the most advanced solar monitoring system of the Federation had just inexplicably gone offline. Yet the protocol for managing this kind of situation was unwritten, and so pressing the equivalent of a "panic button" seemed a reasonable course of action. Now every senior researcher in the facility was standing shoulder to shoulder in the weather operations center, waiting impatiently for an explanation they didn't expect to be worth their time. The watch officer muttered a curse. "SCOPE just picked up on it," he growled, shaking his head. "Must be a slow news day. Goddamn eavesdroppers." Dr. Garcia's glare was burning holes into the new recruit. Everyone in the room figured he'd be bounced back to University within the hour. "Show us what you have." The tech briefly explained his actions before resorting to the playback. The telemetry had to be slowed down to frames just fractions of a millisecond in length so everyone could see it. Every sensor in Cassandra's advanced suite of solar monitoring gear had spiked to impossible levels: subspace, gravimetric, electromagnetic, and more, detected from the high polar orbit of the satellite's pass over the Type-O star half an AU from where they were standing. The source of this frantic energy release was a powerful explosion, roughly triangulated to a source location between the planet and the sun itself. Cassandra's last report was that the potent magnetic field of the star had drastically realigned itself towards that explosion. Dr. Garcia blinked. "Impossible," she mumbled. "Stars can't do that..."
As if remembering something urgent, she glanced at her watch. "How long ago did this happen?" The technician checked his instruments before answering. It seemed like an unlikely place to build a thriving metropolis. Devoid of any atmosphere, Seyllin I was a hellish world whose daytime surface temperature soared high enough to turn lead into molten slag. Though deep within Federation space, the world and system may as well been an unremarkable fringe territory hardly worth the fuel needed to reach it. Sixty years ago, an independent surveyor named Braggs Seyllin left an executive position with Material Acquisition to prospect on his own. Smitten with the endless optimism of a true pioneer, he vowed to build a mining empire that would rival the corporation which launched his career. After numerous years and hardships which depleted the entirety of his fortune, Braggs Seyllin finally struck gold—literally—with TLXX-01, the Federation catalog name of the system which would later bear his name. Deep beneath the surface of that cratered wasteland was a treasure trove of natural resources, including an abundance of heavier metals coveted in virtually every manufacturing sector of the cluster. Undaunted by the steep logistical challenge of harvesting this bounty, Seyllin raised the capital he needed from governments, corporations, and private investors to build his vision of what a mining operation should be: a frontier settlement, run by people operating equipment rather than drones doing all the work on man's behalf. If it were any other world or man, investors would have never accepted the idea. But the abundance of subterranean treasure on TLXX-01 made the effort worthwhile—and Braggs Seyllin was able to deliver not just on his promise to investors, but to the millions of prospectors eventually lured by the opportunity to work and prosper. Leave it to Federation terraforming expertise to create a living, breathing world beneath the surface of an inhospitable planet. In the mined excavation sites where thick veins of precious ore once lay, intersecting caverns big enough to house capital ships were now illuminated in gentle cycles with artificial sunlight; water ran in streams and falls throughout a cityscape that was equal parts lush vegetation and stylish living quarters; atmosphere scrubbers worked with the ecosystem to recycle air and push a comfortable breeze throughout the miles of interconnecting city blocks and work centers. The ambitious subterranean project did as much for the science of transforming worlds as it proved that the mining industry was core to the identity of the nation. In all, four main cities would be constructed: Loadcore, Metal City, Southern Cross, and Valimor. Braggs Seyllin died before the last of these could be completed, but his legacy was already established. At the time of his passing twenty years ago, 8 million people lived on TLXX-01. By the time the planet was rechristened Seyllin I, more than a half billion called those underground caverns home. These were thriving, pulsing cityscapes interconnected by magrail systems that spanned around the entire planet. Peak production for most of its natural resources was fast approaching, but the economic and cultural significance of Seyllin to the Gallente Federation would last long after the last chunk of ore was recovered. Until now, this had been the expectation. Access points for each of the main cities littered the surface of Seyllin I. The most common of these were spaceports, which allowed dropships to transfer passengers and cargo within the safety of shielded containment fields. The planet hosted several space elevators for heavy freight, but these could only be operated at night due to the extreme daytime temperatures. Just beneath these access points was a network of operational support structures, all filled with people like the researchers in the Cassandra monitoring site, elevator freight cargo masters, dropship mechanics, and thousands of others. On the daytime side of Seyllin I, these individuals witnessed a bright flash, then had perhaps a fraction of a second to notice an alarming rise in temperature and hear the sizzling sound of air molecules blown apart by subatomic particles. Those inside surface observatories, such as Dr. Garcia and her colleagues, caught fire immediately and lived just long enough to realize it before their hearts stopped beating. Those at deeper depths were more shielded and thus wouldn't immediately feel their bodies being penetrated and ruined by the invisible onslaught. Instead, a curtain of dread would fall over them as the electronic systems supporting their lives—including those which provided access to the surface both here and on the night side of the planet—suddenly ceased. Theirs would be the irony of being trapped in the dark, when somewhere above them the hottest sun in the cosmos was hurling radioactive fire upon them. "This is no ordinary flare," the CONCORD representative stated. "That much material bring thrown off is characteristic of a supernova, only there isn't enough of it to suggest that a total collapse is imminent. But the ejected plasma is following this new magnetic field at incredible sublight speeds." "So what you're saying is that we're going to lose Seyllin…completely." "As it exists today? Yes." The President clasped a hand over his chin, rubbing absently. "Less than five hours. If everything else remains the same." Souro Foiritan stared ahead towards someplace far from where he was. His eyes were glassy; there may have been just half a drop quivering atop a tear duct. A few moments passed before he spoke again. His voice, though, was strong. "We keep this between us. Not one word about what's going to happen, not even to rescue crews. We'll call them back in as soon as you nail down zero hour. We can…save more people this way." "If that's your decision, we respect it. But as you know, SCOPE is a technically proficient organization which is quite adept at—"
"Take whatever discretions you need," Foiritan growled, looking towards Mentas Blaque and holding his stare for a moment. The Black Eagles commander gave an imperceptible nod before leaving the room without saying a word. "We'll do what we can from our end to keep them quiet," the president said. "If you were down there, would you want to know the end of the world was coming?" The image flickered, and shadows flashed each of the men standing in the room. The CONCORD official never changed his expression. "Mr. President, if I was on Seyllin right now, I would think it had ended already." The dropship pilot pushed the throttle all the forward. The cockpit began to rattle as the instrument panel erupted with red warnings. "We're too heavy!" the loadmaster shouted through the intercom. "We gotta shed weight—"
"Strap yourself in and shut up," the pilot snapped, willing his craft upwards. He could feel the seat beneath him tremble as the craft's twin engines spewed white-hot plasma against the spaceport landing pad. "She's got more than this, I know it..."
Three hundred survivors were crammed into the back, nearly half a ton heavier than the maximum weight that the Federation Pegasus-class dropship could handle for a planet with Seyllin's mass. The military variant was equipped with enough thrust to put less than half as many troops in full combat gear into a hot zone with 1.0 G conditions. Now it was carrying a hold full of screaming victims from the pulse event at Seyllin, plus all the life support systems needed to keep them alive. Most of the victims had horrific burns, some with their clothing fused directly into the skin. This batch had been transported by one of the few magrails still functioning on the daylight side of the planet and pushed to the front of the evac queue. All of them were violently sick, having been exposed to deadly levels of radiation ejected from the system's blue sun. The pilot could see dozens of dropships orbiting the installation near this spaceport; his instruments were tracking even more than he couldn't see. Local tower control was completely overwhelmed—most of the pilots were either relying on broadcast telemetry from carriers overhead, or on their own skill and vision to avoid collisions. All of them were jockeying position to land, take on survivors, and get off as quickly as possible. And though he hadn't seen it himself, he heard that the daytime side of Seyllin I was unapproachable, limiting the number of sites where evacuations could happen at all. Audio warnings foretold of engine failure as the Pegasus strained just a meter over the pad. His loadmaster was shouting a litany of panicked obscenities that in different circumstances might have sounded comical. Keeping one eye on an external camera display, he reached up and flipped two switches on a console; the mounted gun pods on the dropship's nose and wingtips were jettisoned and fell to tarmac. The craft begin climbing quickly as his instruments confirmed that the craft still maintained structural integrity and would survive an ascent into space. He was barely clear of the spaceport when another dropship nestled into the pad, staying clear of the discarded bubble turrets. Even though it was night, the surface of the sprawling spaceport was shimmering in heat. From the IR vision in his helmet visor, it looked like the surface of hell. The Pegasus accelerated upwards. And as soon its hold was cleared, it was going to return for more survivors. "Every affected system had a Type-O star," the scientist stated. "And it appears that every single one of them had an identical event." President Foiritan was beside himself. "‘Identical'? Where else is the loss of life so high—"
"Seyllin was the only world with a notable population," the advisor muttered. "Blue-star systems tend to be devoid of surface life, it's just too—"
The scientist blushed. "The point is…it's not over yet. This main sequence anomaly was just the beginning, but it….was set into motion by something else, something connected to those subspace bursts. It triggered a chain reaction that we're struggling to understand…it's as if the fabric of time and space itself has been wrenched from beneath us." The scientist's hands were trembling, but he had earned the attention of everyone in the room. "Alright," the president said, calmly. "Spell it out for us, but quickly." In a futile attempt to calm himself, the scientist inhaled deeply before starting. "Three other systems besides Seyllin reported multi-frequency burst activity just prior to the solar event. All of it was high-energy, electromagnetic radiation, the kind of energy released in massive stellar events, but…each location is spread across the cluster, and…there are probably more locations than we know about now…"
Prominent beads of sweat had formed below the memory implants in the scientist's brow as the weight of the Federation's highest authorities bore down on him. "Go on…" the president said. "We've detected multiple instances of point-defect turbulence in systems unaffected by these main sequence anomalies." "Wait," Foiritan interrupted. "'What's a point-defect—"
"Wormholes," the scientist said. "The first naturally occurring wormholes since the collapse of the EVE gate." "No matter how hard I try," Empress Jamyl said softly, her clothes drenched with perspiration. "Death follows me everywhere I go." Caretaker drones gently helped her sit upright in the bed of her chambers. Servants no longer looked after her when she confronted her demons. Lord Victor ended the practice not for concern of their safety, but to keep her private affairs as far from the public eye as possible. "We won't know the full extent of the damage for some time," he said, taking a flask of water from the drone and handing it to her. "You're sure the Sansha weren't a target of your adversary?" "No more than Seyllin, or the Great Wildlands, or anywhere else this catastrophe has stricken," she said, accepting the water and downing it. "Yet even this is nothing compared with what is to come." Victor raised an eyebrow. The Sansha were always a prime surveillance and acquisition interest for Imperial intelligence. Their advances in cybernetic technology provided the live realization for the kinds of medical experiments that Amarrian scientists could only dream of. The Sansha have long known that they were being watched, and that errant ships had been captured and dissected by Victor's own men from time to time. He wondered if the Empire would be blamed for the destruction of one of their worlds. "They won't," Jamyl answered, hearing Victor's thoughts as if they were her own. "They don't mourn their dead the way we do. And besides…"
A drone extended an arm to help her stand. It was a strange sight, seeing a woman this physically strong rely on a machine just to stand on her feet. "…they'll be looking in the same direction as us for answers: far, far away from New Eden." Lord Victor watched as she moved away from the drone on her own power, one burdened step at a time. "I'm getting closer to understanding this," she said. "I wish Marcus could see what the empyreans are about to discover. His work would be vindicated." "My lady, I don't understand…"
"You don't need to," she said, waving him away. "Just thank your God that Amarr was spared from this." "You must do exactly as I say," the SCOPE editor breathed, looking hurriedly over his shoulder. "Take this and publish it as-is. Don't wait for confirmation from the others, just do it." The press intern sounded unsure of himself. "Umm, sure. Where, though—"
"Listen to me," the editor snapped, loud enough to draw the attention of several fans as he pushed his way through the crowd. The station promenade was packed for the regional skyball playoffs, but the mood was more subdued than usual as word of the crisis unfolding in Seyllin spread. The editor was under no delusions that he could escape his pursuers by coming here. He hoped only to slow them down, and that this intern could do what he asked before they got to him as well. "Push this report directly into the international feeds. Bump everything else off the queue, this takes flash priority. Do you understand?" "Flash priority? Sheesh, I don't have the clout to do that—"
An unruly fan bumped shoulders with the editor, spinning him halfway around. His heart stopped beating for a moment. "You've been authenticated to send flash…"
He could see them: three men, in black coats. The crowd was separating for them. "Millions of people are counting on this. Send that broadcast before it's too late for them…." "Okay, umm, I'm in the system, and the flash with your ID is queued. Confirm it?" Thankfully, the explosion of pain in his lower back was short lived, as the motor functions in everything from his neck down simply froze. He saw himself collapse awkwardly—the impact probably did physical damage, but he felt nothing. The attack had come from behind; probably a z-stick, he thought, watching the Black Eagles reach out to confiscate his earpiece and datapad. He could tell they weren't being gentle with his incapacitated carcass as they dragged him back through the promenade. They would fabricate a charge against him, but couldn't hold him for long. Blaque and his cronies would face a barrage of protests and legal threats for imprisoning SCOPE reporters, and they were fully aware of it. Which means the ends must justify the means. There is no question that Seyllin is doomed. And people have a right to know that. The editor hoped the message was delivered to the world like he asked, and wondered why doing the right thing was always so difficult. "We don't know where they lead," the scientist continued. "Or, what we'll find once we're there." For the first time since the crisis began, President Foiritan began to face the cruel possibility that what was unfolding could somehow be larger than what had happened at Seyllin. "Warships can enter our sovereign space from them?" "Yes. And though we can't predict where they'll appear, we can say with reasonable confidence that their stability will be affected by the mass that passes through them." "Possibly. But not an entire fleet." "Not an entire fleet," the president repeated, pacing back and forth. 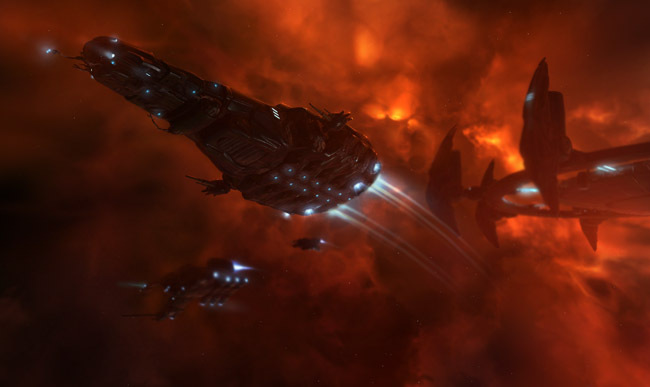 "But, say, a pack of cloaked Marauders, using a direct portal between Luminaire and New Caldari—"
"Or between Luminaire and a system that's not even in this cluster." President Foiritan straightened his posture. His face was gaunt, but he kept his demeanor rigid. "Admiral Ranchel, how agile is your fleet deployment along the Border Zone?" The voice, carried by speakers in the office walls, was loud enough to be heard in the hallway outside. "The strength of our defenses won't be compromised so long as the frequency of wormhole appearances is consistent. As far as location goes, if we can scan it, we can kill it. But we would never pursue a retreating force, not without assurances of where our assets will wind up." "Very well. How many have we rescued from Seyllin?" "Just over half a million." Everyone in the room saw the color leave Souro's face. "The limited number of landing sites makes it difficult," Admiral Ranchel added, his voice subdued. "Given the amount of time remaining, we might be able to double that figure. But not much more than that." No one said a word. The president stood, surrounded by his closest advisors, completely helpless to do anything more. "Keep doing the best you can," he said. "Have you—"
The Chief of the Federation Intelligence Office spoke abruptly. "Mr. President," she gasped. "Mentas was too late." "Wave off and turn back! Wave off or you're a dead man!" For the third time, the Pegasus was hovering just meters over the landing pad. Its pilot could see people rushing the gantries, trying to get into the spaceport's boarding area. "We're out of time!" his carrier dispatch screamed. His mind wandered as the craft hung in the balance between life and death. Someone in that throng of people had surely given up his place to let a wounded man onto the last dropship that would ever touch down on Seyllin. Someone's act of kindness in the midst of a terrible nightmare would be his noble end. That person was right there, so close to where he was. "For God's sake, you're going to get left behind!" Without his conscious approval, his hand pulled back on the stick. The dropship was responsive, eager to fly to the carrier above, and then away from the approaching wall of fire that would bring about the end of the world. The hold was empty, save for a single loadmaster standing among rows of empty seats covered with the blood and gore of those whom fortune or kindness had spared. As though fleeing for its own life, the Pegasus turned its back on the damned souls of Seyllin and hurled away, its lone pilot's eyes moist with tears. The planet of Seyllin I perished, as did dozens of other worlds—some in New Eden, and some that no person in recorded history would ever know about. The intentions of Antar and Kotan were irrelevant now, as the universe of their origin had changed so fundamentally that it would probably be unrecognizable to them. Neither man could have imagined that the consequences of their actions would be so widespread, or that evil could triumph so decidedly over the powers of good. The civilizations of New Eden would mourn for those who were lost, and then search in earnest for the reason why they died. But they would not look amongst the burnt cinders of shattered worlds. They would search for answers by passing through tears in the fabric of space, and venturing towards the unknown.